We are excited to announce the cover artist for the Yosemite Renaissance 32 Invitation, Theresa Grams. 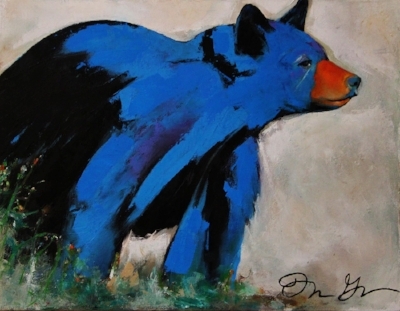 The painting depicts a dynamic and colorful portrait of a black bear, (well actually blue), poised as if alerted to something that has caught its interest. Grams says: "The intent of my art is simple – to share the beauty I see in nature with others. I often visit national and state parks, family farms, some of the 10,000 lakes here in Minnesota, and even go on Sunday drives in the country to be inspired by the beauty of animals and nature. A camera is always within my reach during any trip I take. Once I have an image that really captures my interest, I create the initial sketch on the canvas and then begin the creation process. After the paint used for color blocking of the sketch dries, I use a wet on dry layering technique, often with very bold colors. The multiple paint layers filled with unexpected coloring and texture, along the interest created by a bit of abstraction within realistic figure, brings an energy and depth into my work which I feel helps to showcase the beauty of my subject. Visit http://www.tgramsfineart.com/ to view more works by the artist." The title of the painting, “I was told there would be pie”, draws attention to issues related to human interaction with bears in Yosemite and in wild places across the country. As one of the largest mammals in the Sierra Nevada, American black bears often attract the interest of park visitors, who observe, paint, and photograph them in Yosemite National Park. Weighing, on average, between 150 and 250 pounds, most of Yosemite's black bears are brown in color—despite their name. Seeing one of Yosemite’s 300 to 500 black bears is a special experience that can evoke excitement, awe, and sometimes fear. But what people don’t often realize is while injuries to people from bears in the Sierra are rare, it is more likely a person will cause harm to a bear by leaving food or garbage where a bear can get it, or by speeding on a mountain road. With their incredible strength, curiosity, sense of smell, and hunger (consuming up to 20,000 calories in a single day when fattening up for hibernation), black bears make the best of any food source they find—but this behavior gets bears into trouble. Once bears learn to associate people or human development with food, they quickly lose their natural fear and avoidance of people, and instead approach people and destroy property in their quest to gain more food. Bears will attempt amazing acts to obtain food. They break windows, bend car-door frames, pop open camper shells, and even rip out a back seat to get food left in a trunk of a vehicle. Because these bears become comfortable getting close to people, potential safety issues often results in their being killed. The good news is: this can all be prevented with your help! When spending time in an area with black bears, please remember to store your food and garbage properly. In Yosemite, this means storing food and trash in bear canisters in the wilderness, food lockers while camping in the front country, and bear proof trash cans. Remember that bears are active during the day too, so if you are out enjoying the park, keep your food within arm’s reach. If you do see a bear, enjoy the moment, but please give them the respect they deserve and plenty of space to roam freely and remain wild.